NEW Wacom Intuos Pro Pen and Touch Tablet Computer Drawing Tablet is here. See Wacom Review, My First Sketches and How this Non Artist and Non Techy can now create Artwork and Designs that I can actually sell and create graphic art for my Web Sites. With all the Free Artistic Software that comes with this Digital Sketch Pad, I shock myself at how I can finely get all these artistic ideas out of my head and onto products that I sell. My creative juices keep on going. I Can Barely Draw a Stick Man but look what I can do with my Wacom Intuos 5 Digital Sketch Pad. I can TRACE a Photo right onto the computer. I was delighted and amazed when I looked at it and saw that it actually looks like my husband. What’s also great is the Wacom Medium Pro Tablet is the same Retail Price as the older Wacom Intuos5 Medium Computer Drawing Tablet and it is now WIRELESS, Yeah! No need to buy the Wireless Kit, so all in all, this is a better deal now. Drawing Tablets Amazon will save you money, time and is very convenient. You can also write your own Amazon Wacom Review to help others decide on the big question, What Drawing Tablet Should I Buy. Which Drawing Tablet Should I Buy? This is a long in depth article, so I decided to write my recommendations at the beginning for those who don’t have time to read the full article and look at my first drawings from sketches and photo. Which is the Best Graphic Tablet for MAC and PC? What is the Best Graphics Tablet for Photo Editing? What is the Best Tablets for Drawing on Computer? What is the Best Drawing Tablet for Mac? What is the Best Drawing Tablet for PC? Best Computer Drawing Tablets, in my humble opinion, for most fairly serious Artists, Photo Editors and Future Artists, is the Wacom Intuos Pro Pen and Touch Tablet MEDIUM Size for Creative People who are taking their work seriously as a hobby or for work and who need and desire a touch sensitive, wireless digital drawing tablet. For those who do a good amount of Photo Editing and Artists and even serious Artist Wanna Be’s like me because now I can create art that I never thought I could. This has WAY EXCEEDED my Expectations and I am very happy that I chose the Intuos Pen Tablet when I was deciding on the Intuos vs Bamboo. Thanks to all the people who helped me make that decision. Here is my Beginners, Non Artist View Point of the Wacom Intuos Pro Pen Tablet and why I chose the Wacom Intuos vs Bamboo (now called the Intuos) and finally got the answer to my question, What Drawing Tablet Should I Buy? Wacom has created a Full New Line Up of Products. The Bamboo is now the INTUOS and the Intuos5 is now the Intuos PRO. I will be referring to both of these names until people are used to the new names. This is going to be a little confusing at first but I understand why they did this. I believe they wanted to do away with the Bamboo name all together. I noticed that Amazon quit carrying the Bamboo Create for a while due to complaints about the Bamboo. The Intuos reputations is amazing. Now the INTUOS is the FUN line of tablets and the INTUOS PRO PEN TABLET is the professional Line. Since, I can not draw, I traced pictures that my mom drew for me. I’ve owned my Wacom Intuos tablet for over a year now and I still just love and appreciate all the artistic things I can do with it. I am learning more and more fun and great techniques with the artistic software. (temporarily not able to draw due to surgery and I just can’t wait to get my hands back on it). There is so much I want to do with my artists graphics tablet. Your Creative Juices will be Flowing. Create Products with Your Original Works of Art, Include Illustrations in your Book, Draw and Paint with, for your Websites and Blogs or create beautiful designs for Zazzle. Endless possibilities. My opinion and research of Wacom Bamboo Create vs Wacom Intuos Graphics Tablets (now called Intuos Pro Pen and Touch Tablet). The (now called the Intuos) Wacom Bamboo Fun Digital Graphics Tablet (Bamboo’s new name is Intuos) is more for Fun as the name indicates. It is very popular but as you will see from reading this article, my research revealed that the Wacom Intuos (now called the Intuos Pro) was the drawing and painter sketch pad for me. It is a professional model with a higher pen sensitivity and more touch features. The newest Wacom Intuos Pro Pen is that and more. I consider the Wacom Intuos Pro Medium Size, to be the Best Graphics Tablet for most Artists, Budding Artists and like me, Wanna Be Artists because it is a bit pricey but still affordable compared to the awesome Cintiq, which I believe is unaffordable for the majority of people but really great is Art is your mainstay. I still can’t draw freehand, but I am learning various techniques with my software that almost look like freehand painting and drawing. For now, I need to stick with tracing, editing photos, painting and sketches until I learn to draw with my Wacom Intuos Medium Digital Sketch Pad. After researching Wacom Reviews, I believe the Wacom intuos Medium is the best size for most people because it is plenty big for creating nice size artwork, small enough to fit on your desk in front of the computer or your lap and light and small to carry in a laptop case. In my opinion, these NEW Tablets for Drawing on Computer are the Best Gifts for Creative People. A whole new world was opened up to me. I was especially excited when I saw my First Photo to Sketch of my husband. It really looks like him. 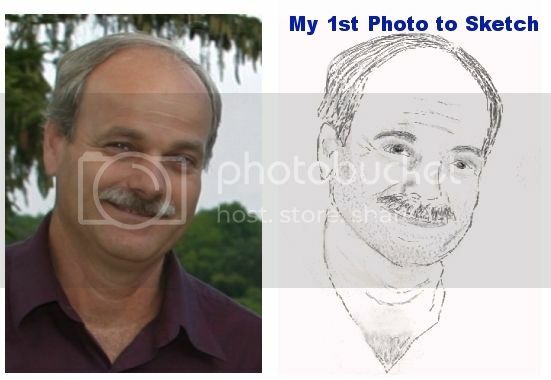 See the Photo of my Husband and my first Photo Tracing of him. WOW! Now I am really excited about what I am going to be able to do with my new Digital Sketching Tablet. What are the Best Tablets for Drawing on Computer for Non Technical People, Non Artists along with expert Artists and Photographers. 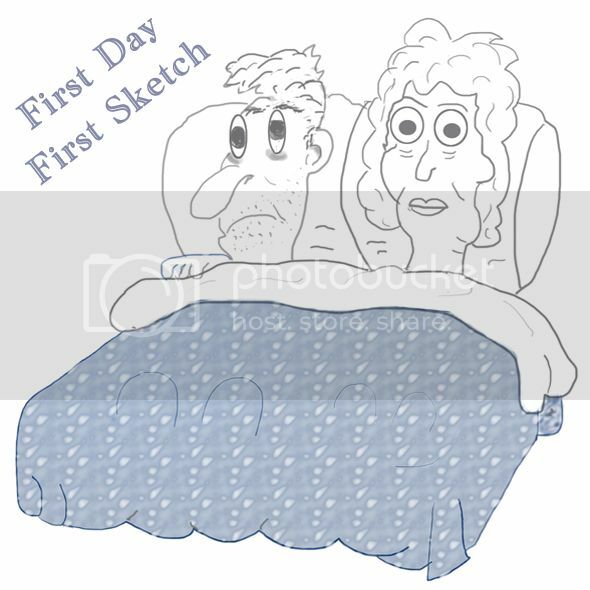 See My 1st Drawings and my First Photo to Sketch that I traced with my Digital Drawing Tablet for MAC and PC. I use my tablet on my MAC but is made to work seamlessly on both MAC and PC. This NEW Wacom Intuos Pro Pen Tablet was recently released. 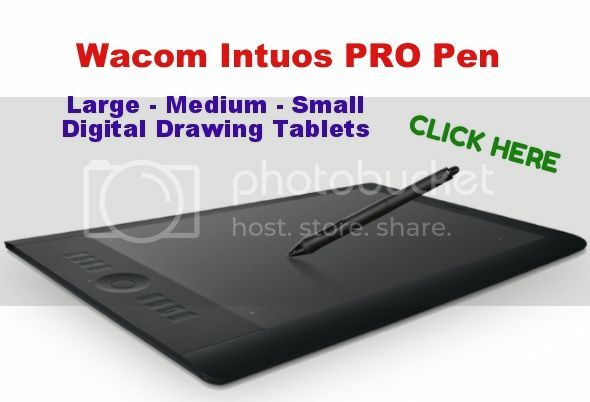 Get the lastest and greatest digital pen tablet from the best graphics tablet company, Wacom: Wacom Intuos Pro Pen and Touch Medium Tablet (PTH651) . See how my Wacom Intuos Medium Pen Tablet changed my life by reading my Wacom Intuos Review (now called Wacom Intuos Pro) below from a Non-Techy and Non Artist and how I am now designing and selling my creations with the Best Tablet for Digital Painting, Photo Editing, Drawing, Tracing etc. I can barely draw a stick man yet with my Digital Sketch Pad, I can now create artwork by Tracing My Photos or my mom’s sketches right onto my computer. See Wacom Reviews from owners of the Newest Wacom Intuos Pro Pen Graphics Tablet. My own review and drawings are of the Wacom Intuos5 (now the Intuos Pro Pen Tablet) and the new tablet is even better with even higher reviews. Here is the Latest and now the Greatest Wacom Intuos Pro Pen Tablet Reviews from owners of this New Intuos Tablet. After reading these reviews I would love to own the New Wacom Intuos Pro Pen Graphics Tablet but mine is still like new and working wonderfully. I did EXTENSIVE Research on the Intuos vs Bamboo (now called Intuos), because I needed a way to trace my mom’s rough sketches onto my computer because I can’t draw. Look at the Photo I was actually able to trace of my husband. It looks like him. You’ll see my 8 Points to consider before buying a Digital Sketch Pad (See Below). Draws Directly onto Your Computer! What Drawing Tablet Should I Buy? What Size Wacom Tablet Should I Get? Read my Wacom Recommendations as to What Drawing Tablet Should I Buy and What Size Wacom Tablet Should I Get? Here’s my RECOMMENDATION for the serious Artist and Artists to Be (or Wanna Be Artist, Like Me). 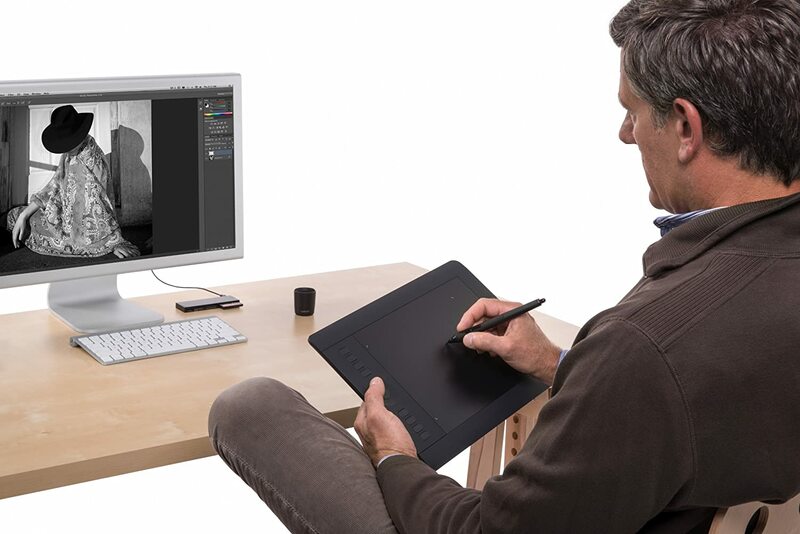 The Medium size digital sketch tablet is perfect for even a small desk. It is easy to transport and large enough to draw substantial sized graphics. The Wacom Intuos Medium Dimensions are only 9.9 inch depth X 15 inches wide and .4 inches thick. The Drawing area is approx 6 inches deep X 9 inches wide weighs only 2.2 pounds, making it super light and easy to transport. Wacom Cases and other accessories below. 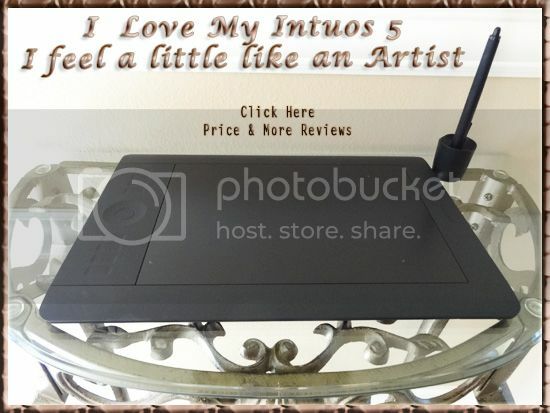 Read My Wacom Intuos Review and the Review by an Experienced Wacom user. See Why I chose to buy the Intuos vs Bamboo Create. Some of the digital graphics tablets are fairly expensive, so I didn’t want to make a mistake by either over buying features or under buying. Please Look Above for Product Links and Photos. Bamboo Create Fun Pen and Touch Tablet. For a “FUN” digital sketch pad, I would recommend the Wacom Bamboo Create (now called Intuos) because the price is around half the cost of the Intuos Pro Pen and Touch Drawing Pad. What is the Best Graphic Tablet for Beginners? I would recommend looking into how serious of an artist, photo editor or graphics artist you plan on becoming and how old. For a preteen or younger, I personally would recommend the Wacom Bamboo Create Pen Tablet or the Splash. This is a super popular and more affordable beginner artist computer drawing pad. For a “PROFESSIONAL” or a serious Artist or a serious Wanna Be Artist, like me, I recommend the Wacom Intuos5 Touch Medium Pen Tablet PTH650. I consider it the Best Drawing Tablet for MAC and PC’s without spending a huge amount as you would with the Cintiq series. Wacom refers to this tablet as a Professional tablet. Even though I am not an artist, I am still very serious about building my Zazzle inventory and my Internet business so I decided on the (now called Intuos PRO Pen Tablet) Wacom Intuos vs the Bamboo Create (now called Intuos). For the more serious beginner artist, who would like to draw directly onto the computer, then I recommended the Intuos5. You can buy Wacom Intuos5 Electronic Sketch Pads at some large electronics store, but every time I checked, they were at FULL Retail price. There is a HUGE selection of Amazon Drawing Tablets and the price is usually significantly below retail. Most of the local stores only carried two or three different models. 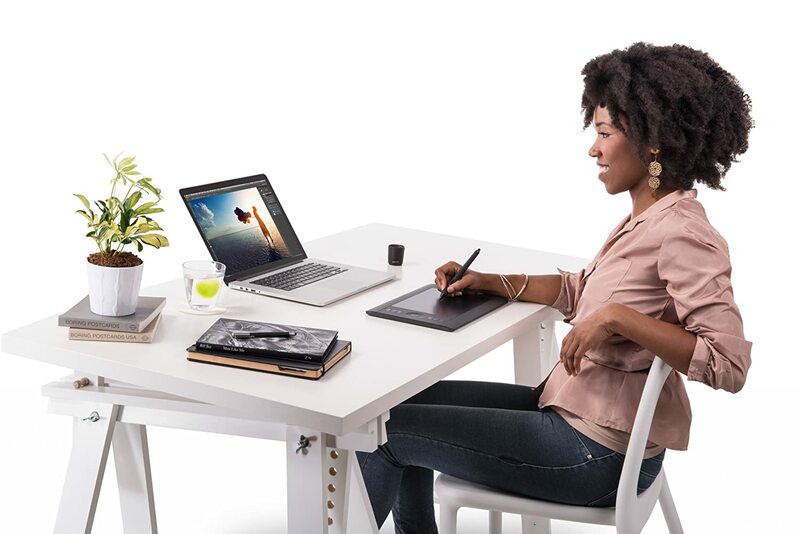 Amazon Wacom Price is like a sale every day and you have the peace of mind that you are buying from a reputable store that is one of the Top 10 Stores in the nation. I have never gone wrong with my Amazon purchases. My mother accidentally bought an item twice, it was very easy for her to return the item to Amazon (watch the number of days for any returns). I never found better prices anywhere (within a penny). Can you imagine how thrilled you will be once your new tablet arrives to your home. It is packed so well and so easy to set up. Once you start drawing, tracing or painting onto the computer, your possibilities will be endless. Remember, it may take you a few days or up to a week to get used to drawing on the digital art pad. Now you can set aside your clunky mouse and use a more precise pen. I place my digital graphics tablet right in front of the computer and sometimes put my keyboard under my Mac or to my left. Try all different spots to see what works best for you. The basic illustration, above, was drawn by my mom. Compare her rough sketch with my enhanced traced version (below), using the Corel Painter 12 cloning feature. This is my very first try at drawing with my new electronic Computer Sketch Pad. Since I am not an Artist, so I traced my mom’s Illustration. My mother is not an illustrator. Her forte is sketching realistic people. She so kindly drew these sketches for me in honor of my belated dad who was a wonderful illustrator. Thank you mom and dad. I filled in the Comforter on the bed with a cool pattern offered on Corel painting software. I actually surprised myself how well my very First Sketch turned out. My excitement led me to want to share this with you by writing this article and why I decided on the – Intuos Review. Thank you for reading this article and choosing to purchase your new tablet here as I am working so very hard to keep building my Internet business. I make a small commission as an Amazon Associate. You can “Contact Me” to ask how you could possibly become an associate with Amazon and or Zazzle. (Amazon Associates have restrictions in some certain states). 8 Points to Consider Before Buying a Graphics Tablet! What is the Best Graphics Tablet for Artists and Photo Editors? It wasn’t difficult deciding which brand would be the Best Drawing Tablet for Artists and Photo Editors because Wacom is clearly the leader. What was a bit more difficult was trying to decide between the Bamboo vs Intuos. Here is my Non Techy and Non Artist view and the 8 points I considered before making my purchase. (wireless is an extra and you may not need it). I did not get the Wacom Wireless Kit, because I felt I could always get it later.I primarily use PhotoShop for Digital Editing and I find it frustrating using the mouse to correct or work with Details. 2. How much to Spend? Bamboo Create Price Wins here. The Wacom Bamboo Fun Tablet (now called the INTUOS) is about 1/2 the price. 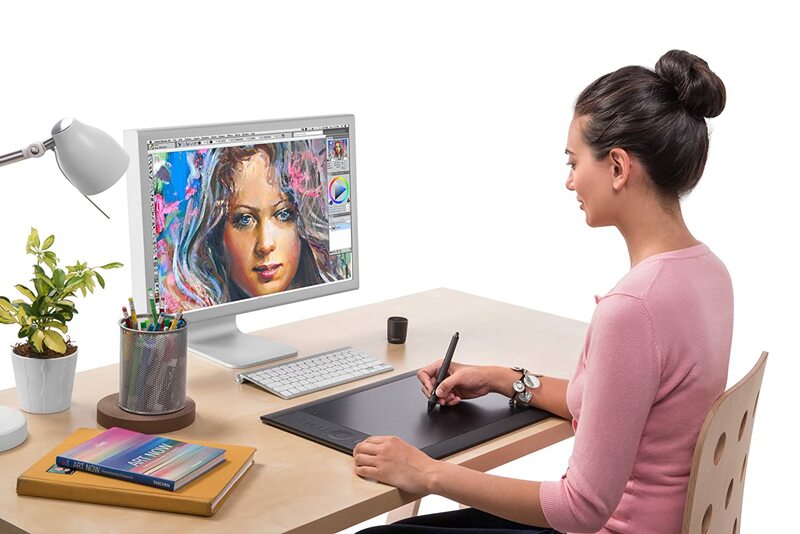 The Newest Wacom Intuos Pro Pen now is Wireless and again has the Touch Screen and buttons. I love these feature. You can turn your work on the sketch pad with your hand. Zoom in and out by touching the screen similar to a smart phone. This is the main reason I purchased the Wacom Intuos vs Bamboo. The pen pressure is about Twice the pressure for the Intuos vs Bamboo. This gives your artwork, photo editing and sketching much more detail and sensitivity. This was extremely important to me, so that my photo editing would be refined. With the both the Bamboo and Intuos, you can trace photos and sketches. I am really interested in painting from my photographs to publish on Squidoo, my Web Sites and creating designs to sell on products. I tried out the Corel Painter 12 artistic software which Wacom offered for a limited number of days. The realistic paint brushes they provide are awesome. Cloning techniques are also available, so I can trace my photos. I also enjoy the paint palette mixing feature. I am however learning more and more about my PhotoShop and enjoying the various brushes you can find online. Both software have great features to offer us. Set up the pad, download the included drawing and painting software and go. (see which software is for a limited time period to try before deciding on purchasing it or not). 8. The Wacom Cintiq 24 HD is incredible for the professional artist. It is the largest of the Wacom digital drawing tablets. The Cintiq price was prohibitive for me. The nice feature of the Wacom Cintiq 24 HD is that you can draw and see your work right on it’s own screen. This would be great but I could not afford it. Color Efex Pro 4 – Test period. Amazing Photo Filters to Create wonderful works of art easily. You can download this software right after setting up your Wacom Graphic Pad Software. I recommend Registering your tablet First and then Downloading all this magnificent Artists Software. The “Hand Eye Cooridination” will feel strange at first but keep at it, don’t give up. You are drawing on the Wacom Digital Sketch Pad but Looking at the Computer. Similar to using your mouse and computer. It felt funny at first but it wasn’t too difficult for me because I have been working on PhotoShop using my mouse, but if you never worked on a Digital Graphic Pad before, GIVE IT a few days to a week to get used to. 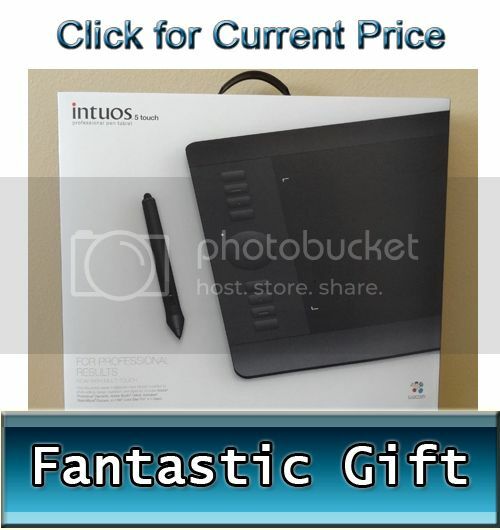 Luckily, I found most places were willing to give you time to try the Wacom Bamboo (now called Intuos) or Wacom Intuos Pro Digital Graphics Pad and allow you to return it, as long as the box and contents are in good resalable condition. Read store return policy first. SUMMARY: See more reviews from others below. The Medium Intuos tablet was my choice. I KNOW I made the right decision. I was tempted to buy the Create because of the lower price point, but after talking to people who own the Wacom Intuos or knew friends who do, they convinced me to spend the extra money. I hope this article has helped you to decide which Wacom tablet to buy. What fantastic Gifts for Creative People to enjoy for YEARS! You Don’t Have to be an Artist to Love Wacom Graphics Tablets and Create Beautiful Graphics! It is very easy for Non Techy’s to figure out how to use and the included softwares help you create graphics without being able to draw, like me. Second Tracing from my mothers rough illustration. LOOK at ALL the FREE Included Artist Software with purchase of the Wacom Intuos Pro Tablet. To turn this Picture into Sketch, I used the Gel Brush on Corel Painter 12 art software. It is fun getting to know the different brushes, pens, pencils, chalk in this software. Gigantic number of brushes and settings to get the look you desire. When you find a brush you really enjoy using, I recommend writing it down on a word document or notepad. Also, jot down the color codes you use over and over in a design. As I mentioned a bunch of times, all of the included software that you get was a really big help in my decision. I didn’t test the Anime Studio Debut for creating animations. I wish I would have at least tried it while I had the chance, but I thought at first I would not have any use for it. I think it would be cool to be able to put animated pictures on my websites and Squidoo to grab peoples attention. I definitely liked the Corel Painter 12 software much, much better than the Autodesk software. I would say that I did not give it much of a chance because right away, I enjoy using the Corel Painter and PhotoShop much better. I can go back anytime and give it another chance because I get to keep the Autodesk software. It is great that you get to test it out first, before making the decision to purchase. Read the extensive Digital Drawing Pad Reviews by clicking on the links below for each product. I found Amazon Drawing Tablets by Wacom to be one of the best prices, trustworthy store and shipped to your doorstep no additional cost. The Art Tablets Best Buy are Full Retail whenever I do a price check and it took them quite some time to even carry the Newest tablets for artists. Illustration was Traced from my Mom’s rough Illustration and then I traced the Image with my Intuos sketch pad and Enhanced it using the Corel Painter 12 software trial included with my Wacom Intuos purchase. 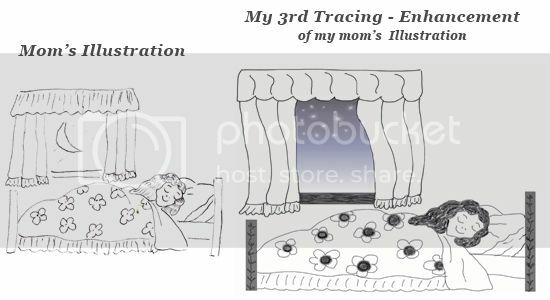 Third Example of Tracing a Picture. I converted it to a JPG file to easily download to my Web Sites and Squidoo. PNG files will work too. I like the Twinkling Star Brush offered on both Corel Painter and PhotoShop. I watched a video to see how to trace a picture using Corel Painter. I scanned my mom’s sketch to my computer. I then opened it up in Corel Painter (ninety day trial period with purchase of Wacom Intuos Sketching Tablet), but you can PhotoShop Elements (Free Software included with this digital art tablet), or any software that works in layers. I created a second layer on top of the sketch layer. Now less the opacity of the original sketch layer to around 50% or whatever you prefer. That way you can still see the original sketch and trace on the top layer. You can check to see how it is coming along as you go. (with my husbands photo to sketch I didn’t look until I was almost done. I really thought it was going to look goofy since it was my first time tracing a photo with my sketching tablet). BEST DIGITAL TABLET for all your computer graphic needs. As you can tell from my Wacom Reviews, I absolutely adore it. For most of my life, I wished I could be an artist like some members of my family, but I just CAN’T DRAW. For some reason I did not inherit that awesome talent. My son is a natural artist. I can however, take nice photos and then trace them onto my computer with my new artist pad. I like the Intuos Medium size because I have a small desk and it doesn’t take up much room. If you are a professional graphics artist and create large works of art, you may want the much larger new Cintiq 22HD graphics tablet. For me, it is way too expensive (approx 6 times more). This truly is the best pen tablet for me. After owning it for a year and half, my enthusiasm has not faded. I love all the opportunities it has given me. (I had to take a break from using my digital drawing tablet due to surgery and it is really tough waiting until I can draw again). Thank you so much for visiting and shopping here at Gifts for Creative People!!! This allows me to bring you more information, reviews and opinions from a Non Technical Person, and Non Artist point of view. I can not express enough the Gratitude to those who visit and go to Amazon through my links as I am an Amazon Associate and earn a small commission. You get the same great price as if you went directly to Amazon yourself. Thank you so much and God Bless You. I hope my Wacom Review has helped you to make the right decision.